Surfboard traction or surfboard grip is a great surf accessory. It can improve your surfing. Increasing your confidence. Helping you do everything from staying firmly on your feet to bigger more powerful moves. One of the most common misunderstandings is that all traction is the same. In fact your choice of grip should be as unique to you as your choice of board. Here’s why. First though, what about wax? Before surfboard traction, wax was and is still used. Wax is much more common for the front area of your board than grip. One reason for this is that surfboard traction can become abrasive on your chest through the constant paddling motion. The reason why some surfers use wax for their rear foot is due to the sensitivity and freedom of movement provided. With wax having less thickness than a tail pad you get a closer more sensitive feel that translates into more responsive surfing. You’re also able to move your foot around more freely, closer to the rail or up the board. The tradeoff is that with wax being soft and pliable you can easily slip if all your pressure goes onto one spot. Wax is also not consistent. It wears down and wears off. You have to keep applying it and roughing it up. It also changes its characteristics with changes in water temperature becoming slipperier in colder water, flaking off in warmer. 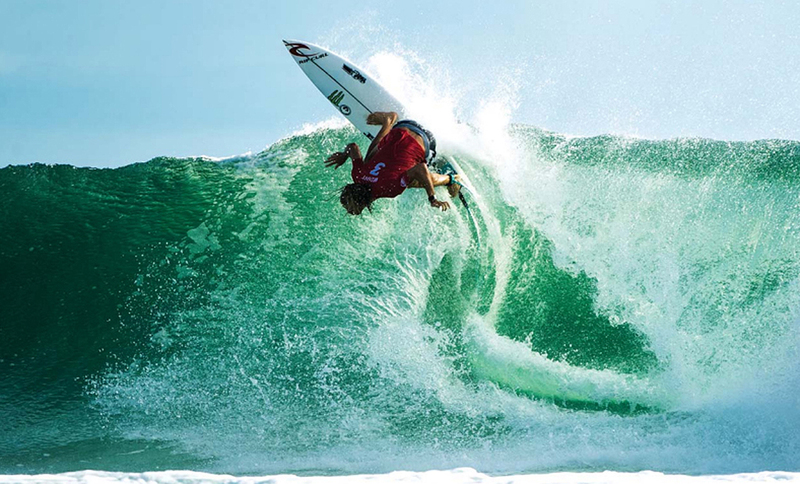 No Pro surfers on the World Tour use wax for their back foot, they all use surfboard traction. This may be because of lucrative sponsorship deals but more likely because surfboard traction works better. Surfboard traction, surfboard grip, gives a number of benefits to your back foot on your board. It: consistently retains its semi-abrasive feel requiring no maintenance; doesn’t wear down or wear off or have a slippery patch; doesn’t soften in relatively warmer water or stiffen in colder water. It’s consistent. This consistency of feel equates to surefootedness for your surfing. You know what to expect wave after wave and can build your surfing performance. The contours and textures of a pad are designed to maximise foot contact from a certain angle. All those product references to ‘Aztec Groove’, ‘Mt Fuji’, ‘Diamond’ and ‘Double Diamond’ refer to the way the grip surface has been etched or molded so as to give maximum traction. Imagine you are pushing hard on the pad, the angle of the pad texture will stop your foot slipping backwards. The angle can also make it easier to move forward to change position. Surfboard pads can have an arch bar or no arch bar. No arch bar makes it easier to move your foot around. It facilitates rail to rail heel-and-toe surfing, a very high performance style. While it’s not impossible to move your foot with an arch bar, the arch is designed to fit to the underside of your foot to give solid placement. With the arch you have to make a more conscious effort to move your foot around. The Pros have no problem moving their foot with arch bars though. You’ll see that arch bars have different shapes, such as tear drops, diamonds and rectangles. There’s also different heights such as 5mm to 10mm. These appeal to your personal preference from a comfort and performance perspective. The arch bar can work in combination with the tail kick so you can realise one of the greatest benefits to your surfing – the grip slot. Where the rear of the arch bar ends where the kick starts, this area creates a slot, a grip slot, that the side of your foot slots into. So once your foot is in the grip slot it has a firm, steady position. Here you can apply power into your moves. It can’t be overstated how much benefit getting this grip slot setup can give your surfing. If you can get the grip slot positioned to match your board’s sweet spot the benefit is even greater. You’ll get your optimal surfing performance from your equipment. More on this below. The kick, the area that rises at the rear of the pad, comes in various heights from 5mm to 45mm. If you have a big foot a larger kick may help your foot stay in place, but too big a kick is just overkill. Personal preference comes into play with your kick too. Some kicks rise almost vertically while others rise at an angle. The more angled there’s a chance your foot could slide off. However there’s also a benefit. If the kick is angled and your foot lands on it from an awkward takeoff you can still stand successfully and direct your board. If it’s vertical you will likely lose your footing. This leads to another kick feature. Some kicks have a flat area on the top, a landing area. So if your foot comes down in the wrong place you can still get grip and surf. Then when you have a chance you can position correctly. Where you place your surfboard traction is vitally important. Ideally you need the grip slot created by the arch bar and kick to be placed over the sweet spot of your board. Your board’s sweet spot is the spot where you place your back foot so that your board gives its best turns and speed, its best overall performance. The question is, as grip has to be placed before you ride your board, how do you know where your board’s sweet spot is? The ideal placement is generally having the grip slot directly over the rear of your back fin. If your board is a short small wave board then placing the grip closer to the tail as possible, right before your leash plug or even around the string, can work well. As your board gets longer you can move the grip forward. Aligning your grip slot with your board’s sweet spot works as when you catch a wave and take off your foot can automatically search for and find the grip slot. You’ll start and continue your ride with your back foot best placed on your grip for your board’s performance. Having your grip slot aligned to your board’s sweet spot will make a huge difference to your surfing and is a key to improving your performance. You’ll find that some boards, like pin and rounded pin tails, have too narrow a tail for standard size grip to be placed over the sweet spot. In this case you need to look for narrower surfboard traction or a single piece grip. It cannot be underestimated the importance of being able to get your surfboard traction positioned correctly on your sweet spot over your back fin. So if your board has a narrow tail don’t settle for a wider grip that forces you to place it too far forward. Two piece pads don’t have an arch bar as it would be cut in half, so they’re for surfers who like a flat pad. Being able to expand the two pieces provides a certain degree of flexibility. However you can’t expand too far before the space is too wide. The two side pieces of 3 piece pads can be placed closer to your rails. This gives you the versatility of both an arch bar and greater area coverage. However you don’t want the side pieces placed too close to the rail where they might create drag in the wave. 3 piece pads are the most versatile. Surfboard traction has one main drawback. It can rash. You’ll find your knee or thigh can be rubbing on the kick when paddling and getting to your feet. The taller the kick, the more this can aggravate. Depending on how much you surf this can be a problem necessitating using a wetsuit. Some pads are less abrasive than others. Those that use a moulded EVA process have a smoother but still grippy finish. The Komunity Bullseye pad and Creatures Mick Fanning Lite are two pads with this smoother type of finish. The EVA pads also tend to be lighter than their counterparts. Creature’s Mick Fanning Lite pad is at least 15% lighter than the next closest pad. While you pay more for an ultra light board if your cheap pad soaks in water you negate that benefit. When applying surfboard traction make sure your board surface is clean. It should be free of anything including sanding dust or finger marks. Don’t try to apply grip to a board that has already been waxed where you want to place the grip. Do a test layout of the grip pieces to make sure you’ve got placement right. Use a small pencil mark if needed so you know the exact position. You want to avoid misplacement that makes your board look unsymmetrical or lop sided. Once you’ve peeled the backing off the grip give it a good press down especially on the edges to make sure it adheres. Some brands quote 3M to indicate the high quality of the adhesive they use. If one part of your grip starts to lift sand and salt will soon reduce it’s ability to stick and more of your pad will start to lift. You can try to stick it back down with a strong glue. The best solution is to make sure you affix your surfboard traction properly in the first place. 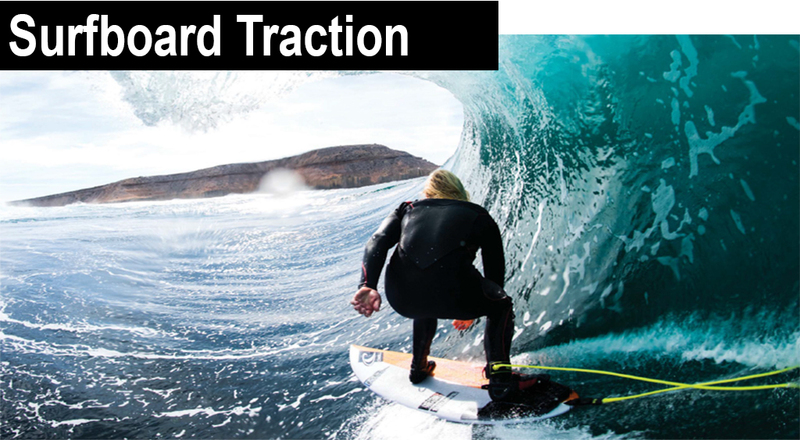 Five piece traction can be used on shortboards to extend the forward coverage of the grip. However five or more piece grip is normally used for mini-mals and longboards. SUPs have multi piece pads. These are heavier duty than you use on a surfboard and are purpose designed for a SUP. Buying online offers a lot of convenience. It doesn’t however help you know which pad, arch, kick and texture, will work best for you. One conclusive way to know is to come into the shop. Ask to lay out a couple of second hand boards with differing grips. Then test them out with your bare foot. This works great as you can almost immediately feel which grip suits you best. Traction has many features. There flat or raised arch. There’s textures, EVA etched or sanded finish. A grip slot and kick height are important too. A test will make immediately evident the pros and cons of each in terms of your preference. A visit in shop offers another benefit in that it allows you to measure your grip on your board. It’s vital that you get grip placement aligned with your board’s sweet spot. This means aligning your grip slot with the back of your rear fin. To be sure about placement you need to have your board and the proposed grip together. A lot of surfboard traction can be too wide forcing placement forward of your board’s sweet spot. When you find surfboard traction you like it’s a good idea to keep an extra on hand so that when you get a new board you’ve got the grip ready to go in case you can’t get it and have to choose an untried one. Getting the right grip for your personal preference, and placing the grip slot over your board’s sweet spot, is one huge thing you can do to greatly improve your surfing.